Discover the area’s best walk in refrigerator service. 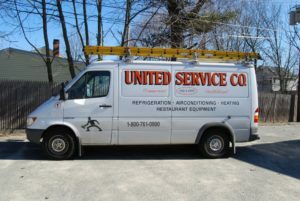 North Shore businesses choose United Service Co. for end-to-end refrigeration projects. Commercial refrigeration is a multibillion-dollar industry in the United States. Many businesses couldn’t survive without reliable refrigeration. Since 1953, our business has built a reputation for success in refrigeration. We design, build, and service walk in refrigerators in the North Shore area. Keep your bottom line and your customers happy with walk in refrigerator service in North Shore focused on giving you accurate temperature-controlled environments. Whether you’re launching a microbrewery or updating hospital infrastructure, our team of experienced technicians can help you create and maintain high-quality refrigerators. Talk to a representative today. Many businesses expect more than simple repair work from a walk in refrigerator service in North Shore. At United Service Co., we try to streamline our customers’ processes as much as possible for a better equipment experience. Design and build services. We offer design and construction work for walk in refrigerators of all sizes. Maintain temperature control and accommodate forklifts with one of our custom designs or create a reach-in unit for small offices. From small reach-in units to large industrial ones, we offer premier builds as part of our walk in refrigerator service in North Shore. Read more about our design work. Refrigerator services. In addition to walk in refrigerator service in North Shore, we service reach-in units, freezers, water chillers, and ice machines. We can install, repair, and maintain most major makes and models. Our family owned and operated business understands the importance of refrigerator uptime. With our preventative and emergency services, you can focus on operations and allow us to take care of the rest. Other services. As an HVAC-R company, we carry the appropriate professional certifications and approvals to work on HVAC units, refrigerators, and appliances. Consider us your go-to team for restaurant industry repairs and services. We service up to 50-ton rooftop HVAC units as well as gas, electric, and steam-driven kitchen appliances. The next time you need walk in refrigerator service in North Shore, let us know. Try one of our services and discover how your business could benefit from our range of HVAC-R services. We look forward to giving you a high-quality experience year after year. Your walk in refrigerator is a profit-building tool. It expands your temperature-controlled square footage for scalability. Take care of your current and future refrigerator units with help from a dedicated and experienced team of professionals. We routinely work with restaurants, hospitals, hotels, grocery stores, manufacturers, and processors. Consider us your go-to commercial resource for all refrigerated units. Our technicians have more than 100 years of collective experience, and we always put customer satisfaction first. We want to earn your continued support into the future. For more information about the best walk in refrigerator service North Shore offers, reach out to our office at (800) 761-0900 or (978) 750-5600.